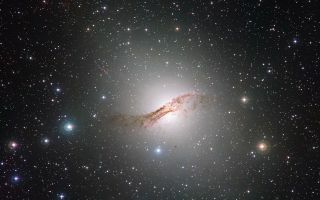 The peculiar galaxy Centaurus A (NGC 5128) is pictured in this image taken with by the Wide Field Imager attached to the MPG/ESO 2.2-metre telescope at the La Silla Observatory in Chile. In this space wallpaper, the peculiar galaxy Centaurus A (NGC 5128) is pictured in this image taken with by the Wide Field Imager attached to the MPG/ESO 2.2-metre telescope at the La Silla Observatory in Chile. With a total exposure time of more than 50 hours this is probably the deepest view of this peculiar and spectacular object every created.